Incorporated as a city in 1815, Detroit quickly experienced significant growth thanks to its location along the Great Lakes waterway, which made it an ideal port and transportation hub. Between 1920 and 1930—thanks to the city becoming home to the thriving automobile industry—Detroit’s population more than doubled, increasing from 465,766 to 993,678 residents. At its peak in 1950, the city had nearly 1.85 million inhabitants. The decline of Detroit’s manufacturing base, especially of its automakers and auto parts suppliers, has led to significant population loss and well as high rates of poverty and vacant properties. Most recently, the city came to national attention when in July 2013 it becoming the largest U.S. city to file for bankruptcy. With an estimated 2016 population of 672,795, Detroit has lost more people than any other large city over the past 60 years. As of the most recent Census, the remaining residents were 83 percent black, 11 percent white, and 7 percent Hispanic. Poverty is a significant challenge in Detroit. As of 2016, well above one-third of all city residents (36 percent) were living in poverty, the highest rate among the nation’s largest cities. However, the level of socio-economic distress seems to be on the decline as this is down from the nearly 40 percent of all city residents living in poverty in 2015. Similarly, while the unemployment rate among Detroit residents is more than double that of the state of Michigan (8.4 percent vs. 3.7 percent, respectively), it is well below its peak of 28 percent in 2009. Helping to affect positive change are a range of community wealth building organizations. For example, in the Brightmoor community, Northwest Detroit Neighborhood Development has constructed roughly 300 affordable homes, a third of which include supportive services for families with special needs. The CDC is now raising funds to build 90 affordable homes, renovate a building into community and nonprofit office space, and develop a mixed-use project with 200 units of housing. On the Lower Eastside, Eastside Community Network has helped catalyze new community resources including four locally-owned restaurants, a community development bank, a credit union, two health clinics, and green infrastructure. Another nonprofit working to boost community wealth is the Detroit Economic Growth Corporation, which focuses on designing and implementing public and private sector collaborations that drive investment, create jobs, and advance Detroit’s economy. In 2015, the nonprofit’s work helped small Detroit construction companies access projects totaling $228.5 million and persuaded 18 large buying organizations to commit $856 million to local purchasing. Following the city’s economic crisis, Detroit’s philanthropic community highlighted its commitment to the region through the New Economy Initiative (NEI), an effort led by the Community Foundation for Southeastern Michigan that combined investments from 10 foundations into a $100 million fund to diversify the economy and stimulate entrepreneurial development. Since 2009, NEI has awarded over $96 million to projects credited with creating 1,610 new companies and adding nearly 17,500 new jobs in the region. To ensure NEI’s continuation, funders added $33.25 million to the effort in 2013. Founded in 1984, the Community Foundation for Southeastern Michigan aims to enhance quality of life in southeast Michigan. As of 2016, the foundation held over $800 million in total assets. Its grantmaking, which disbursed $73 million through 3,800 grants in 2016, focuses on supporting initiatives that prioritize sustainability, have regional impact, can leverage additional dollars, and include collaboration. In 2007, in response to the state’s deteriorating economy, the foundation catalyzed the New Economy Initiative (NEI), an effort that brought together 10 foundations to establish a $100 million fund to diversify the regional economy and stimulate entrepreneurial development. Since 2009, NEI has awarded over $96 million to projects credited with creating 1,610 new companies and adding nearly 17,500 new jobs to the region. To ensure NEI’s continuation, $33.25 million was added to the fund in 2013. Incorporated in Detroit but headquartered in New York since 1953, the Ford Foundation has remained committed to its home city, investing more than $527 million in Detroit since its establishment in 1936. Recent grants have supported community development work led by the Detroit Local Initiatives Support Corporation and the RiverWalk project, which has revitalized abandoned factory sites into a park and a three-mile promenade along the city’s riverfront. In 2014, the foundation pledged $125 million over a 15-year period to the city's “Grand Bargain,” a partnership to help resolve Detroit’s bankruptcy. Anchored by the 877-bed Henry Ford Hospital in Detroit, Henry Ford Health System has revenues of more than $5.7 billion, employs more than 30,000 people, and procures more than $650 million from local providers. Henry Ford actively recognizes its position as an anchor institution, working with many partners to increase its impact in the community. Through a multi-institution partnership, Henry Ford has coordinated with Detroit Medical Center and Wayne State University to help revitalize Midtown Detroit by encouraging their employees to live, work, and invest in the local community. It also helped found a local business incubator at Wayne State, set active goals to procure from local and diverse suppliers, and used its purchasing power to persuade suppliers to relocate to Detroit. Further still, Henry Ford has helped finance education partnerships for high-risk youth, is focused on acquiring and rehabilitating reclaimed properties, and has helped push local infrastructure improvements. Created in 1984 through the merger of two family foundations with origins dating back to the late 1930s and early ‘40s, the Hudson-Webber Family Foundation concentrates its giving within the City of Detroit and has a particular interest in the revitalization of the urban core. Since 1939, the foundation has invested over $193 million in a range of projects and programs aimed to improve the city’s quality of life. The foundation currently has four grantmaking priorities: 1) physical revitalization, 2) economic development, 3) safety, and 4) the arts. Created in 2011 through the merger of the University Cultural Center Association and the New Center Council, Midtown Detroit (MDI) is a nonprofit planning and development organization focused on the physical maintenance and revitalization of the Midtown Detroit area. Currently working to create stronger connections between the city and anchor institutions, MDI initiatives are credited with attracting over 1,456 anchor employees to area housing and shifting anchor procurement dollars to local food, facilities maintenance, and waste management and recycling businesses. Established in 1960, the Skillman Foundation supports quality education, economic opportunities, and equitable civic action for Detroit youth. The foundation awards $15-17 million in grants on an annual basis. To expand its support of resident-led community development projects, the foundation began a PRI (Program-related Investments) program in 2013. The initiative is credited with supporting the expansion of a youth-operated bike shop and the creation of an aquaponic produce growing facility, among other projects. Founded in 1997, Abayomi is a faith-based nonprofit organization serving Northwest Detroit with origins in New St. Mark Missionary Baptist Church. Aiming to improve socioeconomic conditions, strengthen families, and increase dignity and personal achievement, Abayomi—meaning a pleasant meeting place in the West African Yoruba tribe language—focuses on community and economic development, education, and recreation programs to area youth and families. In 2015, its Center for Financial Advancement provided foreclosure counseling, homebuyer education, and financial counseling to over 400 residents, 55 of whom were able to purchase their first home. Bridging Communities focuses on improving quality of life for Southwest Detroit’s elder residents and creating caring communities where people of all ages can live in dignity. Its development program focuses on creating affordable senior housing communities and includes new development and the rehabilitation of vacant, foreclosed properties into resident-owned affordable homes. To build community, create intergenerational connections, and help seniors access needed resources, the nonprofit also manages a timebank, Unity in Our Community. Central Detroit Christian Community Development is a faith-based CDC focused on empowering people and creating positive opportunities for the community. In 2016, the nonprofit’s financial wellness program, which includes homebuyer education, financial education, and home preservation classes, served over 800 people. The nonprofit also rehabbed 8 homes and began a $10 million project which will rehab an old apartment building into 44 modern units. Through its employment programs, the CDC provides job training and work opportunities to about 100 youth and adults per year. Its businesses include City Kids Soup, which sells youth-made healthy soups, and Detroit Remade, which uses abandoned materials to create furniture and home goods. The Eastside Community Network (formerly the Warren/Conner Development Coalition) aims to foster sustainable, positive change in the Lower Eastside of Detroit. Since its establishment in 1984, the Eastside Community Network’s work has helped catalyze new community resources including four locally-owned restaurants, a community development bank, a credit union, two health clinics, and new green infrastructure. Its commercial development efforts are now focused on the Mack Corridor, where it is working with a range of partners to: create a design plan for streetscape improvements and beautification; develop standards for signage and façade improvements; rehab and demolish abandoned properties; and support area businesses. The Grandmont Rosedale Development Corporation (GRDC) works to preserve and revitalize the Grandmont Rosedale communities of northwest Detroit. Through its Housing Development Program, the CDC purchases and renovates vacant homes, assists low-income homeowners with home repairs, and builds new housing on vacant lots. To foster commercial development, GRDC has a pop-up retail space in which local entrepreneurs can test their business concepts. In 2016, the space supported 3 enterprises, one of which has opened a permanent storefront. The CDC also runs a co-working space, which currently houses 15 small businesses employing 24 people. To encourage residents to support local businesses, GRDC coordinates several events throughout the year including a Shop Small Saturday, which brings more than 50 local entrepreneurs together as a grassroots alternative for holiday gift shopping. 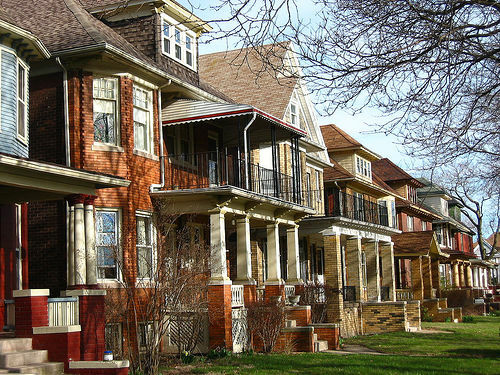 Northwest Detroit Neighborhood Development is a community-based neighborhood organization committed to building affordable housing for low and moderate-income residents in the city's Brightmoor community. To date, it has constructed roughly 300 affordable homes, about a third of which include supportive services for families with special needs, and has renovated 40 others. The CDC is now raising funds to build 90 affordable homes, renovate a building into community and nonprofit office space, and develop a mixed-use project with 200 units of housing and retail space. Southwest Solutions was founded in 1970 as a mental health-focused nonprofit. Recognizing that reintegrating the mentally ill and homeless into the community requires decent, affordable housing and support services, the nonprofit expanded its focus over time to include housing, economic, and workforce development programs. Southwest Solutions is now the largest multi-family housing developer in the region with $150 million of real estate development completed or in progress, which includes 26 buildings that it has restored for both residential and commercial use. The nonprofit also owns a financing organization, Southwest Lending Solutions, through which it provides a range of affordable lending products to homebuyers, homeowners, and landlords. In 2014, its programs were credited with supporting more than 25,000 people. Founded in 1997 to transform an empty church in a neighborhood suffering from gang activity, drug use, and prostitution into a center for neighborhood development, Urban Neighborhoods Initiatives has since expanded to provide a range of youth development, economic development, and education programs in Detroit’s Springwells community. The nonprofit’s work is credited with revitalizing three city parks and developing a land stewardship program that engages residents to maintain over 10 acres of land in the community. To help meet area residents’ transportation needs and provide job training for youth, the nonprofit created a social enterprise, Southwest Rides. In addition to selling affordable bikes and skateboards, the enterprise has an “earn-a-bike” program, which provides free bikes to youth who complete a 6-week education program focused on bike maintenance and safety. Founded in 1994, Vanguard CDC aims to cultivate a vibrant and healthy Historic North End where people live, work, and play. To date, the CDC has developed nearly 100 affordable housing units and renovated a vacant 10,000 square foot commercial space into the North End Career Center (where Goodwill Industries of Greater Detroit now operates). Through all of its work, Vanguard involves diverse community stakeholders in the planning processes to help ensure economic equity and racial justice. Invest Detroit is a CDFI established to support economic and community development in Detroit’s underserved communities. Managing funds totaling $225 million, it finances and supports business development, real estate development, neighborhood retail projects, and high-tech companies. One recent investment supported the development of Gateway Marketplace, a project that transformed a 36-acre brownfield site in a food desert into a retail center anchored by a national grocery—the first to open in Detroit in over 20 years. Founded in 1935 to serve people employed by the newspaper industry, One Detroit Credit Union now aims to provide credible, fair, and reasonably priced financial products and services to all Detroit residents overlooked by the mainstream banking system. The credit union currently has about 12,000 members and assets over $37 million. City Connect Detroit helps Detroit-area nonprofits and governments work together to solve local problems and mobilize funding to support their work. To do so, the nonprofit provides four core services: a) collaborative facilitation; b) incubation of innovation initiatives; c) fiscal and project management, accountability, and sub-granting support to grantmakers and other funding organizations; and d) training and technical assistance, especially around relationship building, collaboration, and fund development activities. Since its establishment in 2001, City Connect Detroit has organized more than 40 community problem-solving initiatives and has helped raise more than $115 million. Build Institute helps people develop ideas and grow businesses by providing access to education, resources, and a supportive, engaged community. In addition to supporting traditional entrepreneurs, the nonprofit runs Build Social, which aims to grow Detroit’s social entrepreneurship movement by teaching double and triple bottom line business practices. Since its start in 2012, Build has graduated over 1,000 entrepreneurs, 85 percent of whom are low or moderate income. The Detroit Economic Growth Corporation (DECG) focuses on designing and implementing public and private sector collaborations that drive investment, create jobs, and advance Detroit’s economy. Through its D2D program, the nonprofit works to connect Detroit-based suppliers and buyers. In 2015, D2D was credited with helping small Detroit construction companies access projects totaling $228.5 million and encouraging 18 large buying organizations to commit $856 million to local purchasing. DECG’s Motor Match Program supports Detroit entrepreneurs interested in starting or growing a business by helping them identify viable spaces and then providing grants, loans, and counseling to building owners and businesses. To date, the program has supported over 760 businesses and has made $3.9 million in grants—investments that are credited with leveraging an additional $24 million. Founded in 2000 to support tech-based spinoffs from Wayne State University, TechTown broadened its focus as it recognized that its programs could also strengthen small, neighborhood businesses. The nonprofit currently offers a range of business programs that help launch and grow both tech and neighborhood businesses at all stages of development. Between 2007 and 2016, TechTown’s programs served more than 1,800 businesses, creating nearly 1,300 jobs and leveraging more than $120 million in start-up capital. The Detroit Black Community Food Security Network (DBCFSN) was established in 2006 to address food insecurity in Detroit’s black community and to organize city residents to take a leadership role in the food security movement. Aiming to promote self-reliance, food security, and justice in Detroit’s Black neighborhoods, DBCFSN focuses on influencing public policy, engaging in urban agriculture, promoting healthy eating, encouraging cooperative buying, and directing youth towards food-related careers. The nonprofit’s seven-acre site, D-Town Farm, grows more than 30 types of fruits and vegetables, and includes a rain retention pond, solar energy station, and composting area. To increase access to healthy, affordable food while building community ownership and creating local jobs, DBCFSN plans to create the Detroit Food Commons, which will include a cooperative grocery store, a kitchen jobs incubator, a healthy food café, and space for community events. Established in 2008 by Genesis Lutheran Church, Genesis Hope works to nurture a sustainable, local economy with community-based, urban agriculture businesses that ensure food security for all Detroit residents. Through its Young Sprouts program, the nonprofit provides job and leadership training to area youth at its youth-operated urban farm and farmer’s market. The farm produces about 1,000 pounds of produce a year, a third of which is distributed free to community members. Aiming to empower urban neighborhoods and address critical social problems, the Michigan Urban Farming Initiative (MUFI) uses urban agriculture as a platform to promote education, sustainability, and community. Since 2011, MUFI’s farm has grown over 50,000 pounds of produce, which is provided to area households on a “pay what you can” basis, donated to food pantries, and sold to local markets and restaurants. The nonprofit is currently focused on a three-acre area in Detroit’s North End community, where it is working to redevelop a vacant, distressed property into a community resource center that includes a nonprofit incubator space and a community garden with 150 raised beds. Operating out of the University of Detroit Mercy School of Architecture, the Detroit Collaborative Design Center (DCDC) is a nonprofit architecture and urban center focused on creating sustainable spaces and communities through quality design and collaborative processes. Since 1994, DCDC has worked with over 100 Detroit nonprofit organizations, community groups, and philanthropic foundations on projects that respond to locally defined issues and empower residents and other stakeholders to facilitate their own community planning, development, and building design. Wayne State University Office of Economic Development’s Detroit Revitalization Fellows (DRF) program aims to help Detroit’s civic, community, and economic development organizations attract, develop, and sustain the best mid-career talent. Program fellows participate in a two-year leadership program while working full-time at a Detroit-based organization involved in civic, community, and economic development. Since its launch in 2011, the program has graduated 48 fellows and is credited with enabling nearly 50 organizations to take on new, high-impact projects. Wayne State University's Labor Studies Center is a comprehensive labor education center committed to strengthening the capacity of organized labor to represent workers, while at the same time expanding the university's research and teaching on labor and workplace issues. The Center's work includes training local union leaders as well as researching labor-community coalitions, community benefit agreements, and regional power building strategies. Since its establishment in 1966, the school has graduated over 4,000 union and community activists. The Front Door for Business Engagement acts as a “one-stop shop” for area businesses interested in accessing Wayne State’s resources such as faculty consultants, research expertise and investments, facilities, technology, licensing opportunities, and student interns. The effort was launched by Wayne State in 2009 as part of the university’s effort to help stimulate economic development in the metro area. The Front Door is located in TechTown, the university’s research park and business incubator.